The brand new GPRSbee is a GPRS/GSM expansion board, designed by Gregory Knauff. It is much smaller, smarter, more energy efficient and cheaper than the original GPRSbee. The board has the "bee" form factor and can be used in any system that has a bee socket like theSODAQ boards, Seeeduino Stalker or the Arduino Fio. The GPRSbee uses SIM cards of the MicroSIM form factor. The core of this board is powered by the SIM800H module. This module, like most other GPRS/GSM modules, has an operating voltage of 3.5 - 4.5 volts and can draw up to 2A of power during broadcasts bursts. This makes the 3.3V power that the bee socket can provide unsuitable. This has been solved by powering the GPRSbee directly from a 3.7 volt LiPo battery. To accommodate this, the GPRSbee has two JST sockets, one to connect the battery, and a second one to provide the power to the main board. When the main board has a LiPo charge circuit (like the SODAQ board has), then this will additionally allow for charging the LiPo battery. When not in use, the GPRSbee is disconnected from the power source. Only the built-in RTC (Real Time Clock) will draw a mere 3uA. This is great for power saving when you compare it to the normal "power down" mode in which the SIM800H still draws 50uA. Switching the GPRSbee on is simple, just set the DTR pin HIGH. To send data to the Internet just brieflyswitch on the GPRSbee (on average 30 seconds) to send the data and switch it off again. This way we can easily make battery and/or solar powered systems. 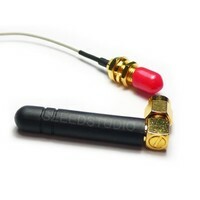 The package includes a U.FL antenna.